Reluctant superhero, David Dunn (Bruce Willis), serial killer, Kevin Wendell Crumb (James McAvoy), and criminal genius / mass murderer, Elijah Price (Samuel L. Jackson), find themselves thrown together in a psychiatric facility. In just three days, psychiatrist, Dr. Ellie Staple (Sarah Paulson), plans to prove that the three are not, in fact, comic book superheroes but simply humans suffering from a specific form of a delusion of grandeur. I am no M. Night Shyamalan apologist. I, like many others, have enjoyed some of his films more than others. Nonetheless, I always want to see his movies. They may not all work, but there is always the potential for greatness. Unbreakable, Shyamalan’s ode to comic books, is just such a film. Years before the birth of the Marvel Cinematic Universe, this thoughtful movie examines the reality of being a superhero. Long considered Shyamalan’s best work , Unbreakable is my favourite of all the director’s films. As a result, the last minute reveal at the end of his last movie, Split, was a truly exciting surprise - opening the door to a potential new universe of heroes and villains. As a result, anticipation was high for the third film in Shyamalan’s so called Eastrail 177 trilogy. However, many questions remained. Would the director be able to pull the elements of Unbreakable and Split together? 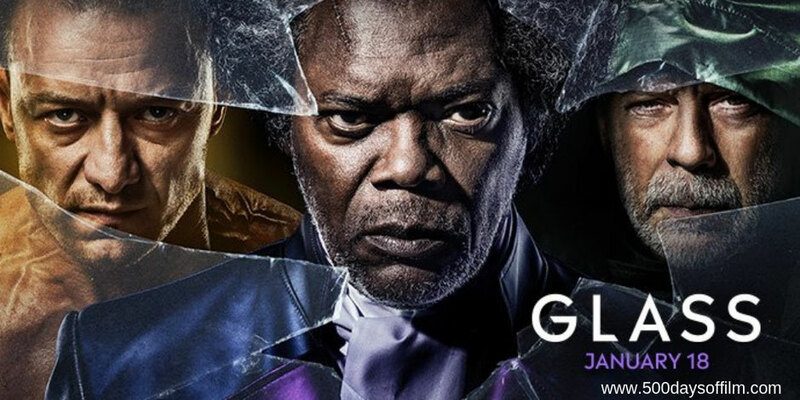 While overlong and containing moments that fall flat when they should thrill, Glass is an enjoyable and ultimately satisfying movie with many interesting twists and turns (this is a M. Night Shyamalan film after all). Glass feels more connected to Split than Unbreakable. It is anchored by a superb performance by James McAvoy. Reprising (and enhancing) his role as Kevin Wendell Crumb, McAvoy is mesmerising - morphing from one of Kevin’s “horde” of personalities to another. We see far more of Kevin’s “The Beast” personality in Glass than we did in Split. This is a character that could all too easily have descended into farce and it is testament to McAvoy’s impressive portrayal that this potential pitfall is avoided - just. We watch as Dr. Ellie Staple (it's always a pleasure to watch Sarah Paulson) brings Dunn (a rather underwhelming performance from Bruce Willis), Crumb and Price together to convince them that they are not superhuman or comic book heros. However, we know that this is not a theory that Price (first name Mr, last name Glass... I just love Samuel L. Jackson in this role) wants to hear. He desperately needs to find meaning in a life that, due to his acute brittle bone condition, has been full of pain and suffering. It is at this moment that Glass reaches out and truly connects with Unbreakable - examining the fascinating idea that comic books have been inspired by the extraordinary abilities of real people. The exploration of these themes and how they challenge David, Kevin and Elijah’s beliefs form the most compelling moments in Glass. While the film’s final act showdown doesn’t quite satisfy, the end of Shyamalan’s trilogy still worked for me - just. My thoughts echo yours! It wasn' the amazing finale I was hoping for but James McAvoy makes it worth a go.